In case you didn’t notice, the price of gold has broken some new highs lately. The latest rally was fueled by comments made after the Fed meeting early this week, which were interpreted by some as signs that more greenbacks will be printed in order to boost the economic recovery that has slowed dramatically in recent months. And that could lead to higher inflation, at least on theory. Gold’s 23.4% appreciation in 2009 was also partly due to the passage of the $800 billion stimulus bill in February. However, as reports from the government have shown, the risk of deflation is actually more real than that of inflation. That did little to discourage from pouring money into gold. Look t the gold price history chart blow. The price of gold has gained 25.8% so far this year and for the past 5 years, gold has appreciated 179.20%. 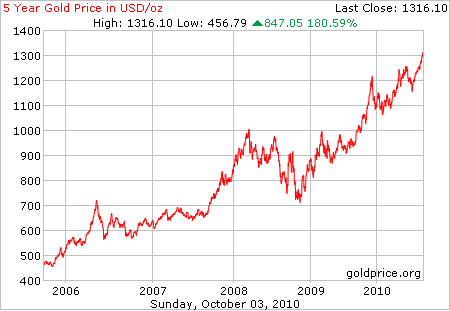 When gold hit the $1,000 mark in early last year (gold did break $1,000 in early 2008 for the first time, but then was traded lower most of the year), I read quite a few articles on how a gold bubble has formed and where the price could be after the bubble burst. The above chart just shows how wrong those predictions are. I bought my first piece of gold in early 2007, an American Buffalo gold coin at $685.14, then another piece one year later at $908. With spot gold currently traded near $1,300, which could be broken today, the gold coin and bar I bought seem to be pretty gold investments. But I didn’t buy them as investment, nor do I really think physical gold is the way to hedge against inflation. That said, I did invest in gold through a mutual fund, Tocqueville Gold Fund (TGLDX), long before I own the Buffalo, because I believe gold should be part of a diversified portfolio. As the predictions of a gold bubble burst have failed and gold price keeps reaching new highs, investors’ interests in the bullion also grow. If you are interested in investing in gold (there are also predictions that gold will hit $2,000/ounce), there are a few choices to add gold into your investment portfolio. Mutual funds usually don’t own the physical gold directly. Rather, most gold or precious metal funds, such as TGLDX, own shares of gold mining companies. Obviously, the performances of gold mutual funds don’t always correlate to the movements of gold prices. Also, investing in mutual funds requires investors to have an initial investment which can go from $1,000 to as much as $10,000 for Vanguard Precious Metals and Mining Fund (VGPMX), not a small money. The gold thing about buying gold mutual funds is you don’t pay commission fees every time you buy or sell shares, but some do carry front loads. You can use Morningstar Mutual Fund Screener to find gold or precious metal funds, as well as information about initial investments and expenses. If I were to start all over again, I think I would choose Exchange Traded Funds (ETFs) over mutual funds as the way to invest in gold. When I started to buy TGLDX shares in 2002, spot gold was below $300/ounce. That was like $30/share of SPDR Gold Shares (GLD), which didn’t exist until late 2004. Now GLD is traded more than $126 a share. In my opinion buying gold or silver ETFs is probably the best and easiest way to invest in precious metals because the funds are backed by the physical metals, meaning you own the metals without actually owning them. There are some several precious metal ETFs available and two very popular ones are GLD and iShares Silver Trust (SLV). You can buy ETFs from any discount brokers the same way you buy stocks. Unlike mutual funds, you do have to pay commissions every time you buy or sell shares of ETFs. Depending on the broker you use, your commission could be anywhere from $0 (with Zecco) to $7 (with Scottrade). All the three options listed above are good if you don’t want to store any physical gold yourself. If you do, however, want to hold gold coins or bars in your hands, then you need to go to a bullion dealer. There are many dealers out there as well, including those you may find in your neighborhood. After comparing a few gold dealers myself before I bought the Buffalo, I went with Bullion Direct for both the coin and the bar because I found they are quite competitive (APMEX is another choice). I know a few places offer such accounts and one of them is the EverBank Metal Select Account. A pool account is a special storage account where a pool of investors collectively own the gold in the account, thus allowing each individual investor own a fraction of an ounce of the metal in the account. A pool account reduces investor’s cost on storage and insurance as these costs are shared by all investors in the account. If you simply want to trade gold or silver, then a pool account is easies way. Kitco, another major online dealer, also has a gold pool account.